At Villanova University, a student-developed app version of Augustine's Confessions brings contemporary vitality and relevance to a classic 4th-century work. Augustine of Hippo, who lived from A.D. 354 to 430, might be surprised to find his Confessions in circulation today, including a number of e-book versions. Still widely read, popular in great books programs and studied in university classes, The Confessions of St. Augustine is autobiography and confession, spiritual quest and emotional journey. One of the most recent electronic versions of the Confessions is an interactive app developed at Villanova University (PA), the nation's only Augustinian Catholic University. 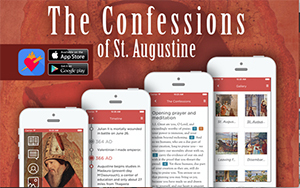 Released three months ago on Augustine's birthday (Nov. 13), the Confessions app is required for all freshmen as part of a "foundation" course. Available for both Apple and Android devices, the app includes the 13 books of the Confessions, authoritative commentaries, photo gallery, timeline, map and text-highlighted audio, as well as search, note-taking, annotation and bookmark options. "The Confessions recalls Augustine's own struggle as a young man to read and comprehend abstract ideas," said Noel Dolan, director of Academic Learning Communities for the university's Augustine and Culture Seminar Program. "What better way to reflect on and update this struggle than for today's students to use technology to bring the text to life through visual, audio and analytical components?" Dolan noted that the app benefits students with different learning styles, allowing them to access the text through a variety of modes. Faculty benefit as well: Instructors of the Augustine and Culture Seminar, Villanova's first-year foundational course, are using the app to develop strategies for teaching and learning. In 2013, Dolan came up with the initial framework for the app, working with Computer Science Professor Frank Klassner and students in his mobile apps class. Klassner's class is team-taught, with students in business and engineering as well as in computer science. "One of our student teams saw the utility of the app," recalled Klassner, who is also director of the Center of Excellence in Enterprise Technology. "They saw it had the potential for promoting the Confessions for study around the country." Klassner's student team spent the spring semester developing a prototype for the app, identifying need by talking with Dolan and other teachers. One of their conclusions was that a social media function was not a good fit for the app at the time. "We decided that it was a better idea to share thoughts and impressions within the course only," explained Klassner. The team made presentations at the end of the semester, including ideas on how the app might be promoted and marketed. Some of the students graduated; others continued working on the app over the next two summers. "It was a labor of love," commented Klassner. "Even though the course was over, they wanted to help support it, and they did, pursuing the project for another year." Dolan and some of her colleagues tested the prototype app, collecting feedback on its look and feel, organization and normal control flows. "The student response was positive," said Klassner. "They liked using the app instead of a dog-eared paperback. They liked having it available wherever they went. And, in particular, they liked the audio presentation." The audio is synced with the text, which is highlighted line by line as the audio is heard. "Regardless of the font or orientation," explained Klassner, "the text flows according to where the audio is." "The Confessions is meant to be heard," Dolan added. "Normally, in the ancient world, reading was done out loud. There is a quality to the text that reflects this. With the audio, you can hear the oratorical side of what Augustine is writing, his pattern of speech." In this way, the audio, and the commentaries, help students to have a better understanding of the text, which makes it more accessible. "This app goes way beyond what's offered by other Confessions apps, which are essentially e-books," commented Klassner. "These are old, profound ideas, which now can be found and accessed in a new app." He pointed out several features that make the app stand apart: the audio and commentaries by distinguished scholars; the ability to add notes and to bookmark important areas; a historical timeline showing events in St. Augustine's life; maps of his travels; and an index of images showing locations and paintings related to his life. Development of the Confessions app gave students firsthand experience in entrepreneurship, noted Klassner. "At Villanova we're encouraging students to think entrepreneurially. The development of the Confessions app in our entrepreneurial mobile app course provides a good model of how you can introduce students to this mode of thinking." At the beginning of Klassner's course, students hear two-minute elevator pitches for many ideas. They then vote on the ideas they'd like to work on, based on their perceptions of the viability of the ideas in the app marketplace. After that, they build a proposal that contains key app features they'll develop during the semester, and a business plan for distribution of the app. Finally, the students identify (and acquire) the resources — time, training, code libraries, advertising bases, etc. — they'll need to accomplish their goals. These plans sometimes have to be reworked to take advantage of new technologies or developments in the educational app field, Klassner noted. This demonstrates to students the importance of flexibility and adaptability in bringing an app to the marketplace – key features of entrepreneurial thinking. Each student's way into the Confessions app is different, Dolan said. "Some students are more visual; some are more auditory. Some are performance-oriented. The more artistic students bring something else to the conversation. Some like linear organization; others like the map, which allows them to visualize Augustine's journey. Whether students are left-brained or right-brained, the app provides a way into the text — an access point for each student's learning orientation." Dolan recalled a conversation with a former student who had been in her foundation class, noting the "amazing" benefits of an app. "The student said to me, 'This reminds me of,' pulled out her tablet, opened the Confessions app and found the section she was looking for then and there." Dolan pointed out that the student made the link between their conversation and the course she'd taken the previous semester and, because she still had the app, was able to access that link on the spot. 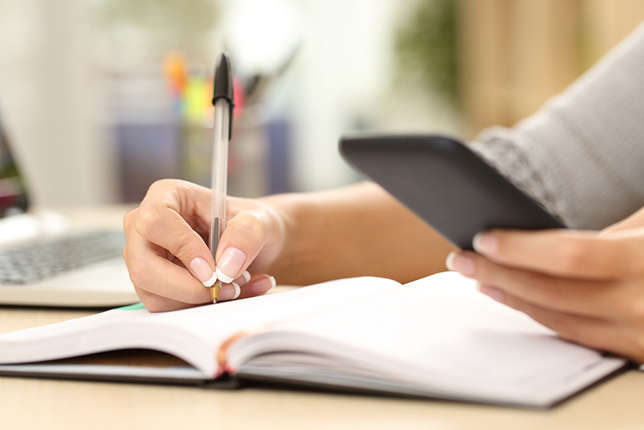 "Unlike textbooks, which students typically rent or resell, an app is something we can hold onto and keep with us," she concluded. "In addition, it's in our best interests to figure out how to prepare for the increasing number of students who come to college already familiar with and expecting to use such applications on their devices." Last summer, Villanova's IT department took over development of the app. "We felt it was important to move beyond the prototype to something that could be published for use around the country and around the world," said Klassner. "The re-built app reflects all of the feedback and observations. While the students worked on it as a labor of love, the IT office needed to go beyond that. The app's interface and underlying implementation are now more professional in nature."